Jules Darling: Get Glitzy Nails for the Holidays! Get Glitzy Nails for the Holidays! I often read and admire the beauty ideas of the many bloggers I follow, but I rarely venture to copy the looks. But after reading this over at Makeup and Beauty Blog, I knew that I had to try out this ombre nail trend for myself! All that is required are two nail polishes that have chunky glitter and a little bit of patience. I used Essie in Set in Stones (the silver) and L.A. Girl Glitter Addict in Animate (the red). I first applied a base coat to my nails, then three layers of Set in Stones over the entire nail. Once that dried, I took the Glitter Addict polish and applied it to the base of my nail and about half way up. Afterwards, I topped it with a coat of Seche Vite dry fast top coat, which helps to speed the drying time and smoothes the nail (rough nails are always a problem for me when I use glitter polishes). 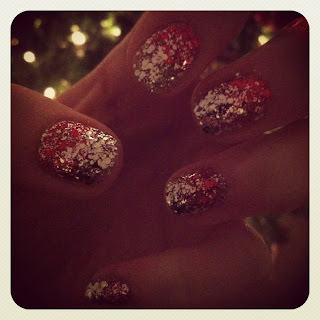 The finished result is a festive, glitzy nail perfect for the holidays! Update: Just scratched my face with my nails by accident. Note to self: glitter polishes are rough. Time for another layer of Seche Vite, methinks!